As dark evenings draw in, Borealis in Borough offers Londoners a serene Nordic inspired retreat. 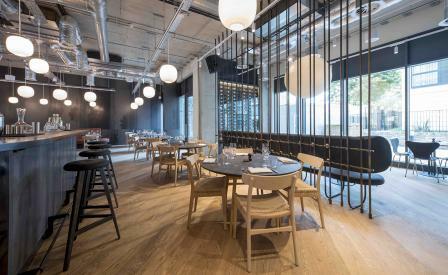 The concept, from restaurateur Soren Jessen of city-worker favourite 1 Lombard street, is Scandinavian, simple and fresh, and like Lombard, offers a characterful spot worthy of both a smart meeting or an intimate dinner for two. Borealis is connected to Fora, a pioneering co-working company from Enrico Sanna and Katrina Larkin, who worked together with design studio JLK to curate an atmosphere that combines effortless Scandinavian cool with a suave London member’s club aesthetic. Hans Wegner Wishbone chairs in oak and rows of low hanging Louis Poulsen VL45 Radiohus pendants bring warmth to dark timber surfaces and bespoke, ribbed metal dividers. And, the service matches the concept and design, as Fora train their front of house at École hôtelière de Lausanne. Scandi-staples ensue across the menu and the freshness of the fish and meat makes up for the simplicity, where capers, cress, ligonberry, dill, shallots, horseradish, pickled cucumber, beetroot and Kolhrabi, all reoccur in variously refreshing melodies.